My general question is why brushless DC motors seem to be much more expensive than similarly sized brushed permanent magnet motors, especially considering that the construction of the latter is more complicated? In my concrete application, I'm looking for a brushless DC motor with a 10-15W max power rating. I was first looking for an alternator of that range, but this kind of product practically doesn't exist, I believe because a BLDC fills this role pretty well. Using a BLDC as a generator is a very attractive idea - since you're not driving it, you don't need to worry about ESCs, you just throw in a 3-phase rectifier and you're done (also, it's much easier to detect the running speed by detecting the zero crossings on one of the phases. And some BLDCs have Hall sensors as well, which makes it even easier). Comparing an in-runner BLDC to a brushed DC of similar size, you'd expect them to be practically the same in terms of construction, with the latter adding the brushes and the commutator - you'd expect it to be slightly more expensive. My research indicates that the reverse is true: a decent BLDC fetches upwards of $100 in most reputable electronics shops (e.g. Electrocraft in the UK), even in Alibaba they are $30+ (the price break for 100 units), and even RC-craft units optimized for onesies from eBay are $15-$20. Then you can definitely buy s very well machined japanese brushed motor (e.g., Mitsumi) for a few bucks. Why is that? Are BLDCs still considered a novelty and economies of scale do not yet apply to them? Or am I missing some technical detail? Brushless DC motors typically use strong permanent magnets on the rotor. This does some nice things, like alleviate the need to get any electrical power across the rotating interface. It also allows for Hall effect sensors to determine the position of the rotor. However, these strong permanent magnets currently require rare-earth metals, such as neodymium. Being rare but in demand makes them expensive. Depends on which bldc motors you are talking about. Those bldc motors used in computers are quite inexpensive. Those ones used for drones are expensive due to their ability to handle large current and complexity / numerous windings but most importantly the lack of economy of scale. My company once had a project to quote a high volume system based on stepper motors or bldc. So on high enough quantities the only remaining difference is encoder, which in some cases isn't even required. But the best part is that performance and closed loop itself sometimes allow even cost reduction compared to steppers, as the motor may be precisely selected for application, while stepper often tequired wide margins. Bottom line, since the appearance of modern electronics bldc are not more expensive to drive and not more expensive per same performance. I suspect that the brushless DC motors use neodymium magnets while the brushed ones use less expensive magnets. Also the brushed motors are manufactured in very large quantities for all kinds of inexpensive products. Even though the Mitsumi motors are good quality, the brushless motors sold for quadcopter etc. may be better quality. There also may be less vigorous competition in the consumer market for brushless motors. 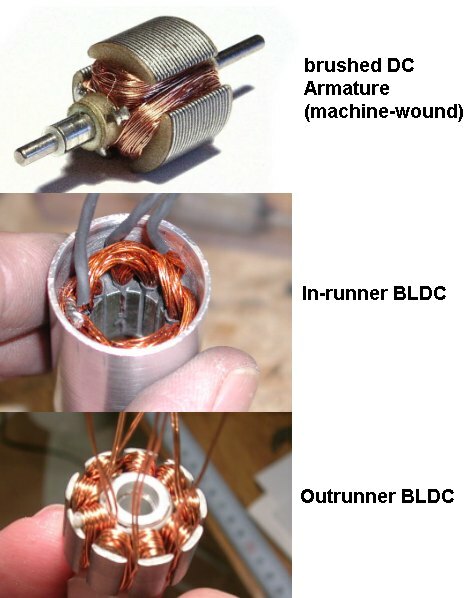 The construction of an 'in-runner' BLDC is quite different to a conventional brushed motor. Instead of an armature it has coils arranged around the inside of the stator. Due to the restricted space, the windings on most small in-runners have to be installed by hand. This is a difficult and time-consuming and job, which makes them more expensive than machine wound brushed motors. you can definitely buy a very well machined Japanese brushed motor (e.g., Mitsumi) for a few bucks. Well machined perhaps, but not in the same league as a good brushless in-runner. Even cheap rc hobby inrunners have neodymium magnets, ball bearings and cnc machined aluminum cases. Peak efficiency is typically over 80% (compared to 60-65% for small brushed motors) which translates to lower loss and much higher power for the same size. And they can spin at up to 60,000rpm, whereas brushed motors are limited by brush bounce and excessive wear at high rpm. The biggest cost advantage of a brushed motor is often the controller, which can be made much simpler if bi-directional operation is not required. Not the answer you're looking for? Browse other questions tagged motor dc-motor brushless-dc-motor brushed-dc-motor or ask your own question. Why BLDC Motor controllers are only 120 degree and 60 degree why not other degrees? BLDC Motor Constants: Why is my Kt and Ke different?